Ruby is a brown classic torbie w/white. She has lots and lots of that beautiful red in her coat. You guessed it that’s where she gets her name, she has two beautiful red stockings on her back legs. 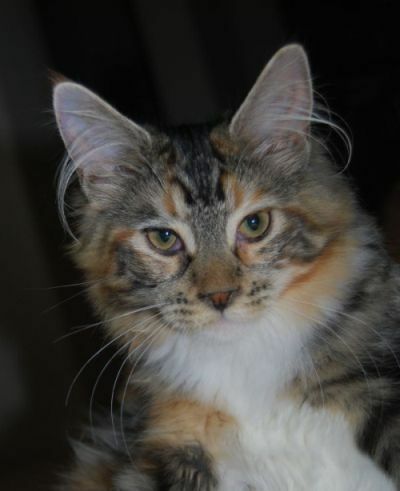 Her brother and sister were named, The Wiz, and Glinda (now Whatatrill Bella Luna of CascadeMtn). Ruby is from Meg’s second litter and Kona’s first litter. We are so happy with this wonderful litter of three we will be repeating this breeding again this summer. Ruby is now living the life in Livermore with her new family. We look forward to seeing lots of pictures of Ruby in the future.